Bestselling author and Bible life coach Sheri Rose Shepherd shares 14 truths that will forever change the way you love and are loved. 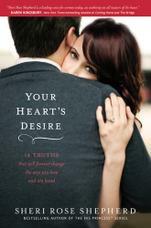 This book is written for the married woman who loves her man but struggles in her marriage. It’s for the single woman who wants to find a godly man to love and for the divorced woman who believed in her marriage until her man walked out. Each chapter has life-challenging love stories, love coaching, powerful prayers, inspiring scriptural love letters, and a Transforming Truth. If you’re ready for a refreshing perspective on love, men, and marriage, this book is for you.